What’s Fall without a great big batch of Cabbage rolls? Each year we whip up a big pan of these hearty Cabbage Rolls and eat till we burst. We use an old recipe that was first published in the Palmer Rapids cook book. It’s a culmination of recipes from all the ladies in the town. This one certainly stood out as one of the very best and it’s a Family Tradition at our house. Elfie’s aunt Iona, then her mom and now the TwoFoodNuts have adopted and adjusted the recipe to make the Best Darn Cabbage Roll Recipe Ever! One of the best things about food like this is you can make a ton of it and it tastes as good or better when it’s been frozen. So, one mess and many meals is a great solution to busy lives. Besides just because life gets crazy doesn’t mean we can’t eat well. 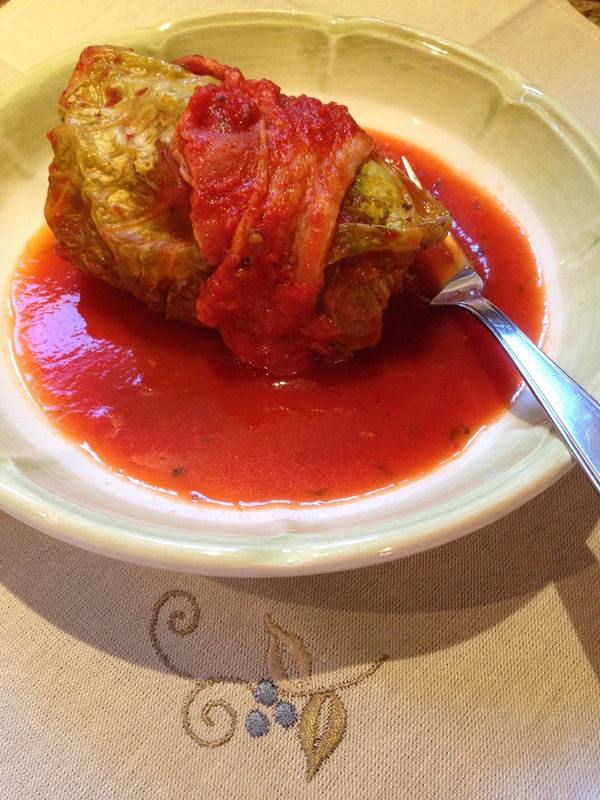 We serve our cabbage rolls with a chunk of crusty bread slathered in fresh butter. You really don’t need anything else! Bacon slices sufficient to cover the entire top of the Cabbage Rolls. 1 red chili, seeded and minced (Optional but oh so good). Cooks Tip: This is a big job, but being organized is the best method. 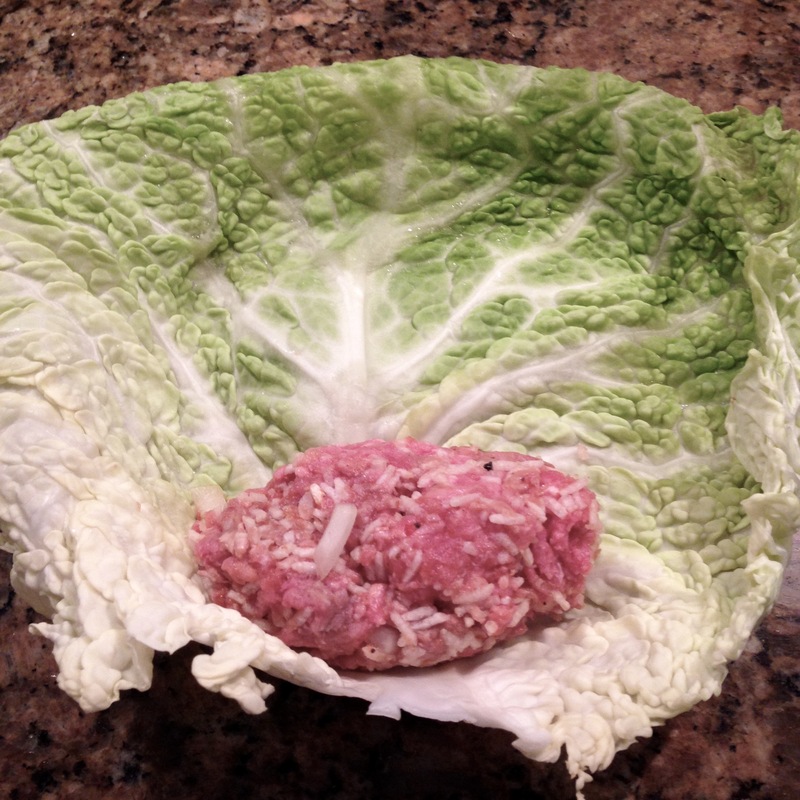 We remove the cabbage leaves first, then make the sauce, and finally assemble the filling. Now you have all the parts of the recipe ready to go. The actually rolling takes very little time. 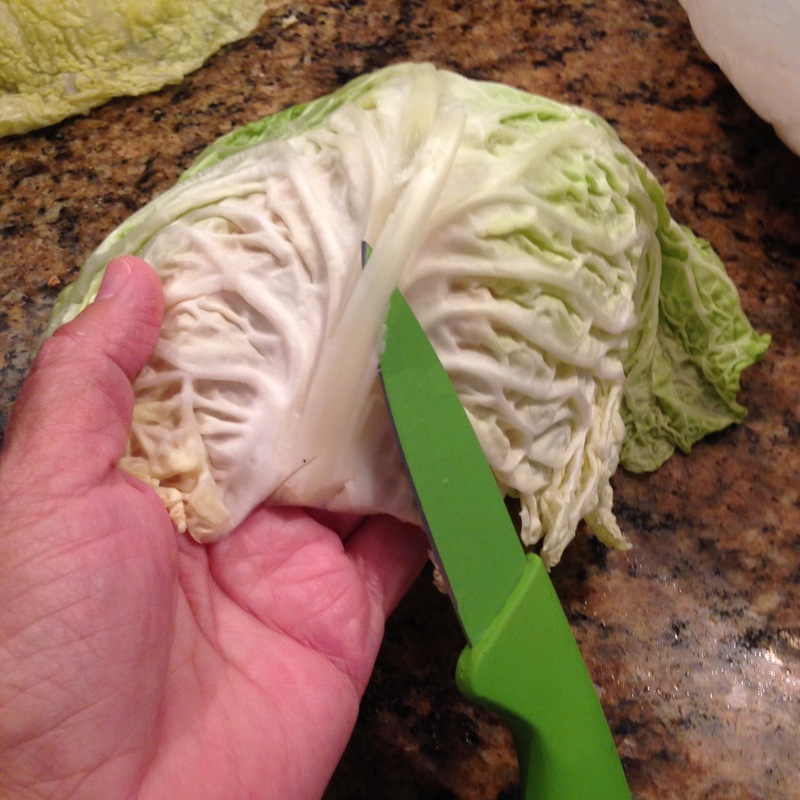 Using a very sharp knife, cut around the core of the Cabbage. Place the Cabbage into the microwave for 5 minutes. Peel off the softened leaves and reserve. Repeat this process until you have 18 leaves. 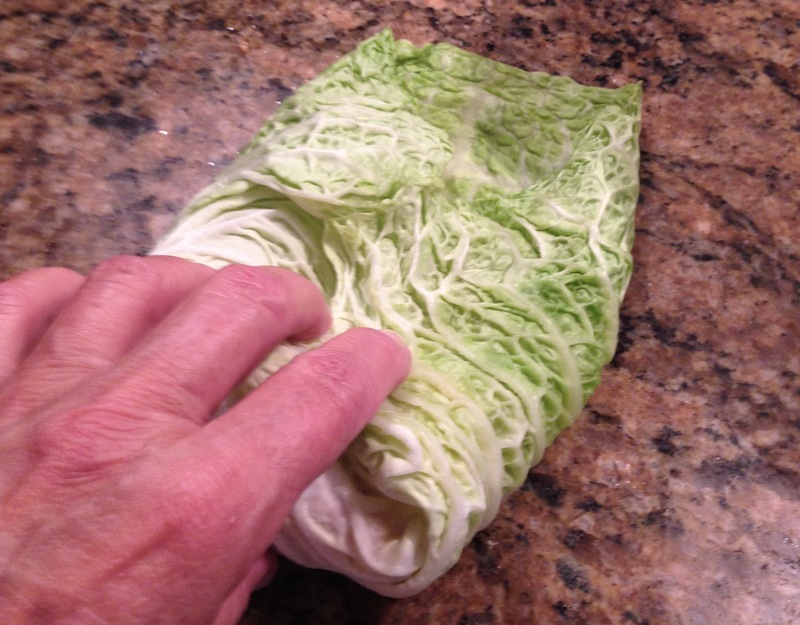 Cut the heavy rib off on each piece of Cabbage to make it easier to roll. 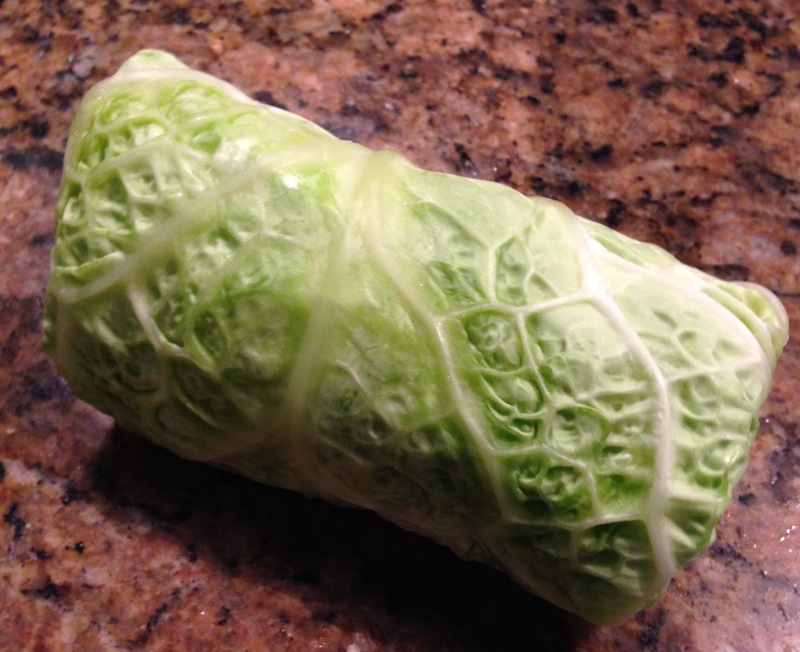 Place the filling at the core end of the Cabbage leaf and roll away from yourself to encase the filling. Now fold the sides towards the middle and continue to roll into a tight packet. No need to use tooth picks, just place the roll with the seam side down in the roasting pan. Continue until all Cabbage Rolls are in the pan. Pour the Secret Sauce over the Cabbage Rolls and lay the bacon evenly over the entire roasting pan. It will seem like too much sauce, but the rice is raw and will absorb a great deal of the liquid. By the time the Cabbage Rolls are fully cooked there will be just enough sauce to serve. (If you are short on sauce, just add a bit of water). Cover with a lid or 2 layers of tin foil. Place the pan in the center of the oven and cook for 2 -3 hours or until the cabbage is very tender and the sauce is somewhat reduced. 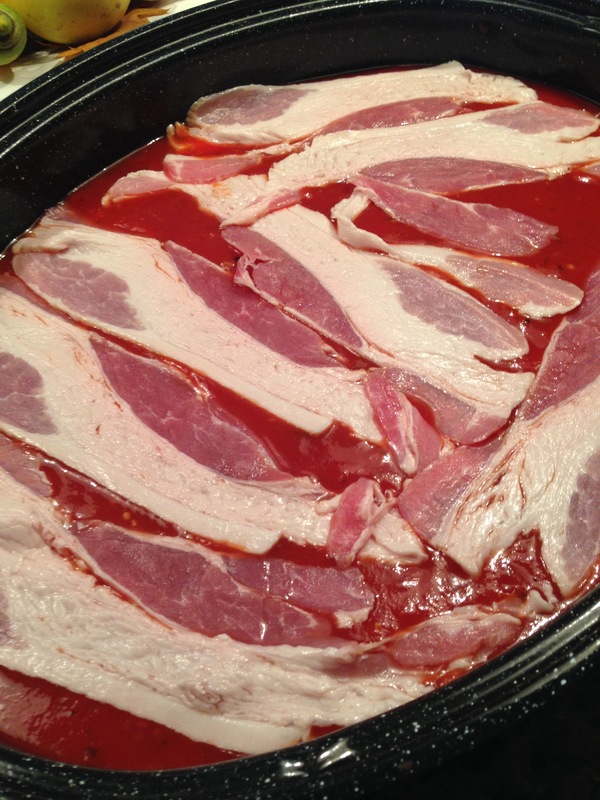 The bacon will not be crisp but the fat will all be rendered out making the sauce very rich tasting. The bacon also imparts a slightly smokey taste to the Cabbage Rolls. You can discard it once the cabbage rolls are cooked, but we eat it. We are so pleased to share this family recipe with you. We hope you’ll give it a try. We know you’ll be delighted with the outcome. Pick a rainy day and Rock and Roll!